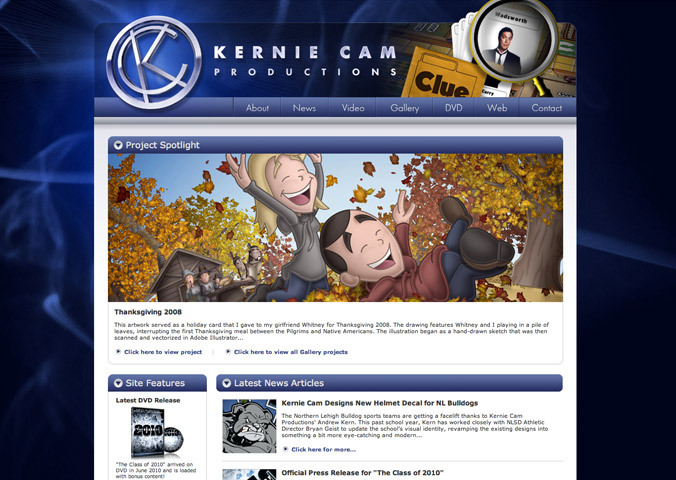 Built using HTML, PHP, CSS, and MYSQL, the new website for Kernie Cam Productions launched in September 2010 and featured a database-driven Portfolio and News archive, higher-resolution video content, and an enhanced navigation system. The site was retooled from its earlier versions to provide an improved, user-friendly interface and to allow for easier site updates. Kernie Cam also continues to offer high-definition video content whenever possible and has expanded its online portfolio to include separate DVD and Web categories, while continuing to add other print and illustration work to the Gallery. A new-and-improved Contact page, an Awards listing, and a Project Spotlight are just a few of the other exciting features that have been included in this redesign of the Kernie Cam Productions website.